A Line installation is a Forerunner defensive outpost, part of the Maginot Line, intended to prevent enemy ships from reaching the inner worlds of the Orion complex. The Maginot Line, or Jat-Krula as it was known to the Forerunners, was constructed over half a million years before the firing of the Halo Array as the ultimate defense for the inner systems of the ecumene. The Line installations, arranged in sets of four and numbering in the millions in total, were placed in strategic locations, particularly along the most efficient and well-known slipspace pathways, forming an enormous spherical territory surrounding the Orion complex. Any incoming enemy ship or fleet would have to pass through the perimeter, where it would be trapped, seized or destroyed by the Line installations in range. The Line installations could fire into slipspace, thus preventing any unsanctioned ships from bypassing the sphere. These installations are usually located on a planetary body, such as a natural satellite. As part of the Forerunners' efforts to contain and understand the Flood, some Line installations were refitted to serve as Flood research facilities. These installations employ machines known as Gatherers, specialized for collecting specimens for analysis. Each Line installation also has its own monitor and a control center, as well as a sizable force of Sentinels. During the Forerunner-Flood war, Line installations were used as containment measures against Flood-controlled spacecraft, meant to prevent them from reaching the Forerunner core worlds. However, in the later years of the war, even these measures began to fail and the Flood would occasionally slip past gaps created in some segments of the boundary. A number of Line installations remained active following the Forerunners' disappearance, and continued to intercept spacecraft of future civilizations that passed near them over the next hundred millennia. During the Human-Covenant War in the late 2552, the ONI-commissioned mining ship Long Time Coming, as well as the Covenant assault carrier Clarity of Faith were shot down by Line Installation 1-4's defenses while in Slipspace. 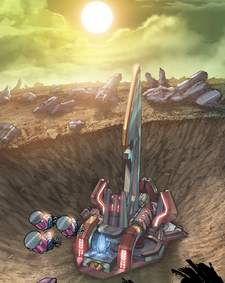 Both of the ships crash-landed on a moon in Sub-sector 35 on which the Line installation was located. Personnel were taken by Gatherers into the main facility of the installation, for study by the installation's Monitor, 686 Ebullient Prism. During the Battle of Line Installation 1-4, the installation's control center was located and used by Team Black to shoot down an entire Covenant fleet in Slipspace. Line Installation 9-12 was discovered more recently, when a group of scavengers were stranded on its surface. Setting up a makeshift camp, the scavengers sought to uncover valuable artifacts from the surface of the world. However, they subsequently disappeared, leaving behind only their final transmissions, which included detailed environment scans of the Line installation. These scans were later appropriated as a Spartan War Games training environment designated War Games Map_Set/: 893-3 aboard UNSC Infinity. In Halo: Blood Line, the main control center of Line Installation 1-4 is modeled after the Relic on Harvest. While this may be an instance of the artist using existing visual reference material without fictional considerations, it may suggest that the Relic is in fact a Line installation. Views of two beam-projecting towers at Line Installation 9-12. Closeup view of one of the towers. Concept art of Line Installation 9-12.